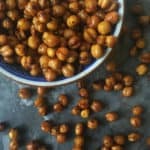 These crunchy Honey Chipotle Roasted Chickpeas make a great snack that pack a sweet and spicy punch. In a colander, drain and rinse the chickpeas. Place them on a paper towel and pat with another paper towel to dry. Spread the chickpeas on the baking sheet. Drizzle with 1 tablespoon olive oil. Sprinkle with salt and pepper to taste and toss to coat. Bake for 30 minutes. Remove from oven and stir. While chickpeas are cooking, combine 1 tablespoon olive oil, honey, chipotle and cinnamon. Drizzle honey mixture over chickpeas. Sprinkle with salt and pepper to taste and toss to coat. Bake for another 15 minutes, until crispy. Remove from oven and allow to cool for 5 to 10 minutes before eating.